We begin with an in-depth consultation and exam to determine if you are a good candidate for dental implants. We get started on any preliminary work you may need. Some patients need gum disease treatment or a bone graft before they’re ready to receive implants. Once your mouth is ready for implants, we perform the placement surgery. Over the next few months, your body heals and your jaw forms a strong bond with the implants through a process known as osseointegration. We place a restoration on top of the implants in the form of crowns, implant-supported dentures, or an implant-supported bridge. Everyone’s implant journey is different, which is why we can’t arbitrarily give you an estimate for the price of your new smile. The total amount you end up owing will depend on a number factors, including how much preliminary work you need, how many implants we place, and whether your insurance will help cover the cost of the procedure. When you come in for your consultation, we can crunch some numbers and give you an idea of what your dental implant cost in Plano will be. 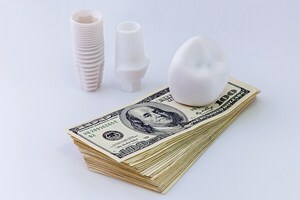 Implants tend to cost more than other tooth replacement methods. However, they represent a better long-term value because of the numerous benefits they offer. 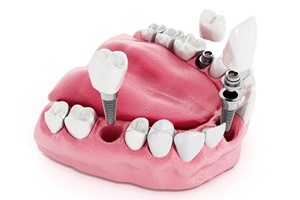 Are Dental Implants Really Better Than Other Tooth Replacement Options? Implants have the potential to last a lifetime if you care for them well. These tooth replacements can stand up to all of the rigors of everyday life. After you get used to your implants, you may even forget they’re there. This is in contrast to traditional dentures, which may irritate your gums if they do not fit correctly. Dental implant restorations look just like natural teeth. You’ll be able to smile with confidence! Bone preservation. The bond that the implants form with your body can help to prevent the bone loss that occurs with missing teeth. Dental implants have a very high success rate. 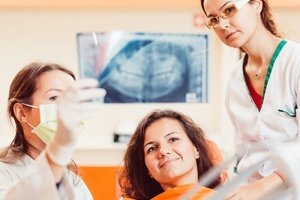 According to some studies, more than 95 percent of patients enjoy a successful procedure. However, there is a small risk of complications. Infections and other factors can cause problems, which is why it is so important to see your dentist regularly for checkups. If an issue does arise, it may be possible to fix it before the implants fail altogether. Your have good bone density and bone height in your jaw. To learn even more about dental implants, please contact our office.